We went to a party tonight so I decided to make a nice (and simple) lunch of succulent lamb chops from Arcadian Pastures slathered in local garlic and homegrown rosemary on our new grill for myself and Henry. I served the lamb with a simple salad of lettuce and scallions from Chubby Bunny, tomato and cucumber from Halsey's Farm Stand on Deerfield Road in Water MIll and some oil and local vinegar. 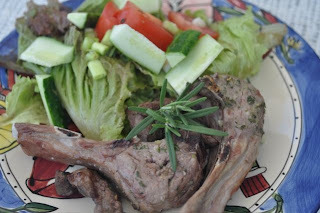 Mouthwatering, with a rich lamby, garlicy and rosemary taste -- gamey and fresh but in a good way. Take lamb chops out of the refrigerator to allow to come to room temperature. Wash rosemary and remove leaves from stem, discard any tough stems. Peel an entire head of garlic, about 8-10 cloves. In a food processor, puree rosemary, garlic and olive oil to make a thick paste. With a pastry brush, generously apply rosemary and garlic puree to both sides of the lamb chops. Preheat grill to 400 degrees and cook for 3-4 minutes on each side for medium rare meat.